Hi all. Forgive the straight copy-and-paste from a media release, but I received this from the Disneyland Paris team and found it really interesting. So thought I'd share it with you all as an insight into backstage goings-on, particularly linked to Robert's recent piece about artistry in parks. 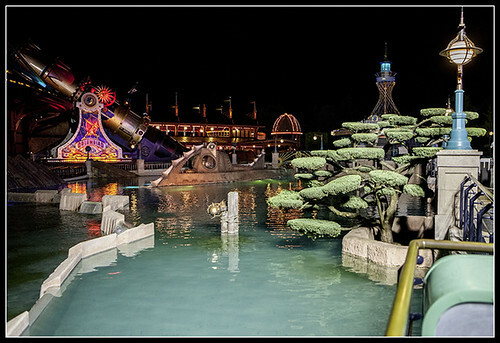 Discoveryland has its own particular type of landscaping. Niwaki, that’s the Japanese word for expressing the essence of a tree, through the pruning and shaping of its foliage and the training of its limbs or trunk. Vegetal adaptation, that’s the creative use of plants and gardens by the Nature & Environment division to set the stage for the stories featured in the parks. 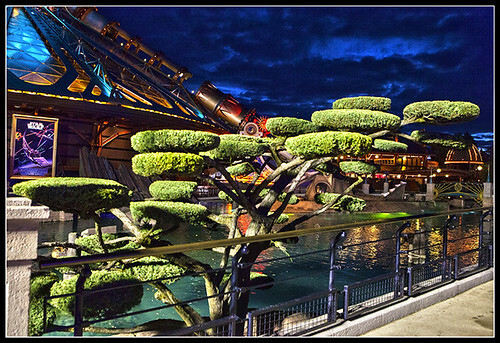 In Discoveryland, the landscapers have set an otherworldly vegetal stage with their imaginative plantings. 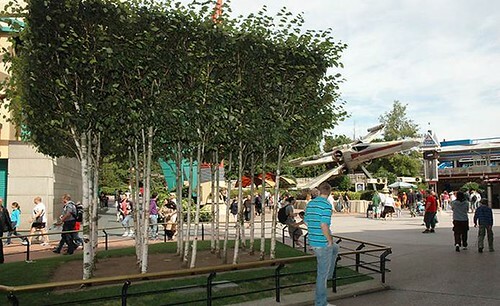 As in the Star Wars opus, the deep past and the distant future are two aspects of the Discoveryland experience. A little park of plane trees painstakingly pruned, their branches trained in an even, horizontal canopy evoke an array of antennas. Identical white-trunk birch trees evenly spaced in a grid mimic a crystalline subatomic structure. Plants of bold and contrasting colours call to mind the stark clarity of outer space. 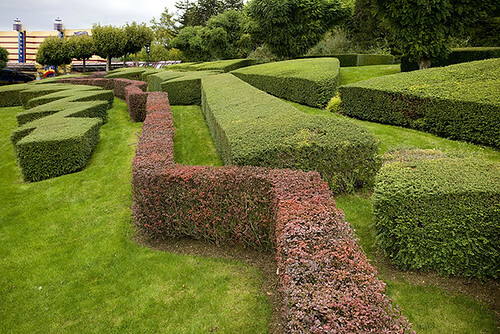 Shrubs pruned into basic geometric forms with sharp, clean edges simulate modern architectural forms. Always on the lookout for new techniques and processes to further the thematic expression of Discoveryland, a team of three gardeners and two apprentices, headed by Laurent Reneux, were struck by the unusual beauty to be found in formal Japanese gardens – Niwaki in particular – or cloud pruning as it is known in Europe. Charles Beaumont of the team took it upon himself to learn the technique. 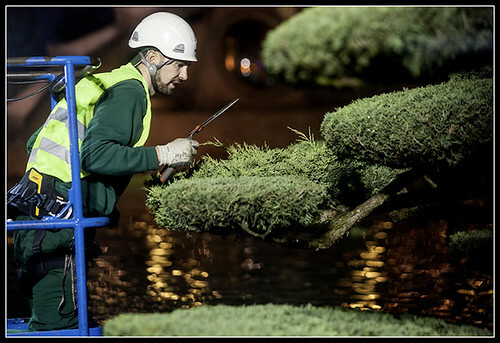 To Japanese gardeners, asymmetry and odd numbers are more esthetically pleasing – so sometimes branches are removed from trees (primarily Junipers) and guy wires attached to train the trunk to a less than straight shape. A dose of fertiliser is added to the ground and tools (shears and clippers) are disinfected. “You must have a sense of symmetry (or asymmetry) and a good deal of patience,” confided Charles. In forming the typical ‘cushions’ or cloud prunings of Niwaki, the first step is to reduce the natural tufts of foliage with pruning shears while removing all the dead wood and residue. New growth shoots are conserved but trimmed with special shears into the gently rounded and smooth ‘cushion’ form, totally distinct from any neighbouring one. “Everything is done by hand,” continued Charles. Since Niwaki trees are typically more mature Junipers, our gardeners carry out their work hoisted aloft in cherry pickers and in the very early morning, before park opening. 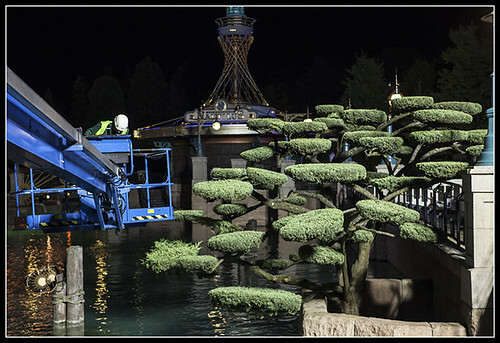 The Cloud trees of Discoveryland may be found next to the pool where the submarine in Les Mystères du Nautilus is berthed and at the backstage passage to this attraction. Find one also within the Autopia attraction and next to the Annual Passport Office. A future project will perhaps see cloud trees at Golf Disneyland Paris, where a cluster of mature Junipers next to a waterfall could form a perfect, idyllic Niwaki cloud tree scene. No responses yet. Why not be the first to reply?